Vauxhall cars (the company is known as Vauxhall Motors) was born in UK and it became a very well known car company. Vauxhall Motors is a company subsidiary of General Motors- the world’s largest automaker. The company was founded by Wilson Alexander in 1856 in a beautiful London city that gives the company name- Vauxhall. Initially, the company name was Alex Wilson and Company, then Vauxhall Iron Works and it was specialize in building pumps and marine engines. First Vauxhall car was built in 1903. It was a 5 hp model, using a tiller, 2 forward gears and no reverse gear. Interesting, don’t you think? Beginning with this model, the car was designed in many other versions and then were available for sale. When things start working, the company decided to increase its production and moved almost entire production to Luton in 1905. The company was selling cars under Vauxhall Iron Works brand. This stopped in 1907, when they’ve decided to call the company “Vauxhall Motors”, a name kept over the years, till our days. The company was characterized by its sport models until the 1st World War and then designed only austere models. Vauxhall Motors was bought by General Motors in 1925 for 2.5 million $. And from that year Vauxhall was influenced by American cars and with Ford (that was Vauxhall’s main competitor) influenced the style of European car manufacturers. During the 2nd World War car production was suspended because Vauxhall was needed to work on the Churchill tanks which was designed and assembled at Luton in almost 1 year. There were built over 5,600 Churchill tanks. 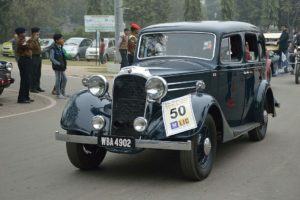 After the war, car production resumed but models were designed as a more mass-market product leading to expansion of the company. In the 60’s Vauxhall acquired a reputation for making rust-prone models and that was very bad for it. Although the corrosion protection built into models the reputation dogged the company until the 80’s. From the 70’s, many of company models were designed and built in partnership with Opel in Germany (Adam Opel GmbH- known as Opel is an automobile manufacturer based in Germany). Models like Chevette, Cavalier and Carlton were basically restyled versions of the Kadett, Ascona and Rekord. The Viceroy was a simply new version of Opel Commodore imported from Germany. And that was the beginning for the “Opelisation” of Vauxhall. General Motors policy was that Vauxhall to be rebadged Opels, designed and developed in Russelsheim with much less help from Luton. In 70’s and 80’s General Motors sold duplicate cars: Opel and Vauxhall alongside each other. General Motors Europe then began to standardize model names across both brands in early 90’s. Almost all Vaxhall’s models now have the same names as those of Opel (the exception is VX220 sold by Opel as Speedstar). The Luton plant closed in 2000, but production still continues at the plant in Ellesmere Port. Despite already meeting efficiency targets, Vauxhall has been told to further improve its productivity. Nowadays Vauxhall and Opel still reside together making the same cars but selling them to different markets. So remember if you buy an Opel it’s a Vauxhall and vice versa. More information at this URL http://www.carsandtuning.org/cars/vauxhall/ about Vauxhall tuning and news. Tudor Mateescu is a writer at http://www.carsandtuning.org/ cars and tuning blog.